Buy 1, Save 30% on all others! - Free shipping to all U.S.
2 or more 30% $22.47 per pc. Wooden Bridge and Bird Curtain by Ambesonne offers you all the elements to create a magical atmosphere in your home. 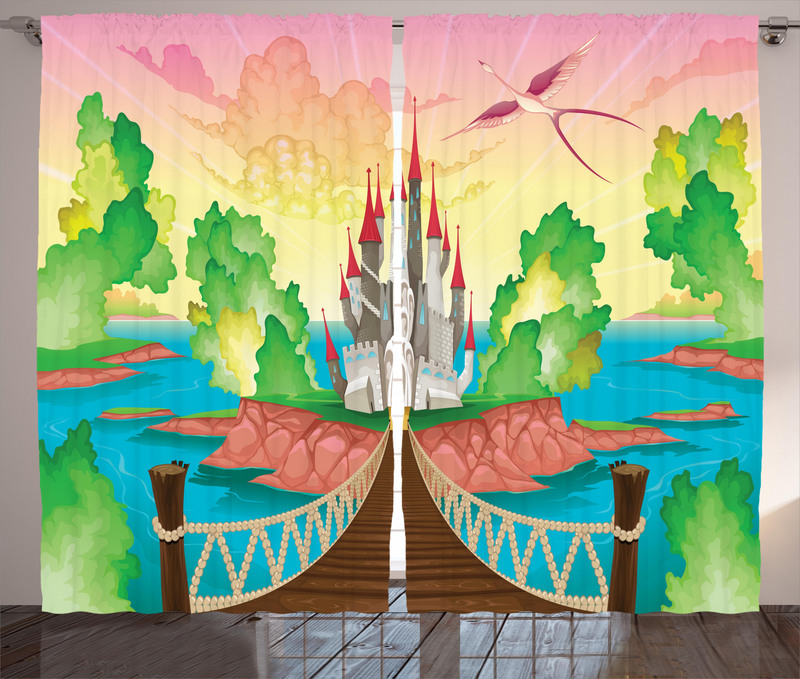 Children curtains with 3D like realistic motifs, are available from 108x84 to 108x108 sizes with its unique Multicolor color. Children inspired product with its 2 curtain panels will provide an elegant look into your home decoration and it will cost only $74.90. You can find fashionable and stylish curtain fabrics for every style from the online curtain store, Ambesonne. Take advantage of the great prices of hundreds of products delivered directly from factory to customer. Buy now online with free shipping! The set includes two panels. Measurements are the total of the 2 curtain panels together. Features 2.5 inch rod pocket. No hardware is included. You don't need to use curtain tiebacks to enjoy these amazing and artful designs. Our products are just designed for your convenience; so all you need is a curtain rod bracket and rod. Ambesonnecurtains light up your room with special and marvelous designs. Our products are versatile. You can use them for sliding glass doors if they are not so large and lengthy or just keep it simple and hang them on your windows. You don't need curtain rings to hang them. They are already available with sewed hanging holes. Due to manual measurement, please kindly allow 0.5 inch discrepancy. Our products do not have any harmful substances for you or your pets. Machine Washable On cold delicate cycle, Hang dry only. No fading. Machine wash on cold delicate cycle with mild detergent and water; Do not bleach. Iron on low heat from the back if needed. I got the ‘Ocean View At Sunset’ curtains with umbrellas, chairs palm tree and spa. I needed a functional fashion statement to block sunlight and heat at stairwell windows. I was more than pleased with the beautiful motif the curtains created and effective heat shield on sunny days. For perfection, I lightly steam ironed them on lowest setting to get minor wrinkles out. Ambesonne Service was even better! I had ordered/measured the wrong size (height) and they stepped up sending me a larger size at no additional charge or shipping charge! FANTASTIC PRODUCT and SERVICE! I wanted to write a review months ago when I got them, but apparently there was a software “glitch” that did not allow me (and perhaps many others) to write positive reviews. Hopefully you can find a way to post my photos of the curtains installed: closed with filtered sunlight, closed with LED back light and open with tie-backs cause they are AWESOME! These curtains are even better than I expected; the material is exquisite and the colors are perfect, as is the design match between the two. - Lynn C.
I love my new curtains! The quality of the material is top notch. The printed design conveys the feeling of being in snowy, deep woods. Glimpses of sun-rays promise warmer days, but one savours to linger in this enchanted forest just a little longer. Reminds me of my native Austria. I am very happy to have found ambersonne.com and I have recommended them to all my friends. If you are hesitating don't !! Buy these you won't be disapointed !! I wanted something exactly right to bring the lush patio I created into my living room. I began looking at shower curtins because I've purchased from Ambersomme before. When I could not find what I wanted on Amazon I decided to see if there was an Ambersomme web site. There was and not only did they make shower curtins, they make curtins. I'm so pleased with these, and very happy not to have to make shower curtins do! They look perfect and the material is just right. Thank you so much!